We love to hear from you how we can provide better service and classes to you. Do share any concerns you have with the front desk at any time or email us at enquiry@pilatesfitness.com.sg. Back of voucher design – there’s space for you to write love notes! 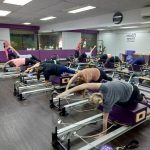 Each voucher at $150 entitles you to 5 Pilates Fitness group classes. Voucher redemption is valid till 31 May 2018. Once voucher is redeemed, the 5 classes are valid for 6 weeks from redemption date. As such, the voucher classes are valid for use till 14 July 2018. The 5 classes per voucher cannot be shared.